You may have heard that the right pillow can help you sleep better—and that is entirely correct! 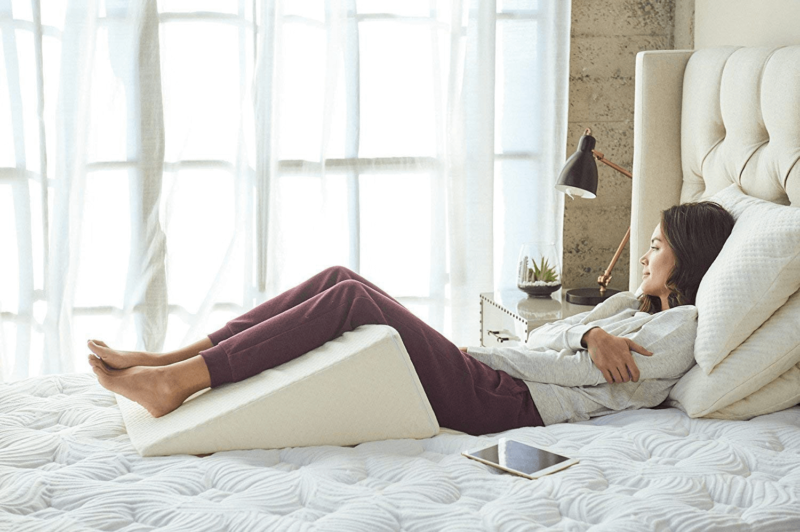 Finding a great mattress can significantly improve your sleep health, but sometimes, it can be beyond your current budget. Enter: the orthopedic pillow. First things first: Is it orthopedic or orthopaedic? Some hospitals and medical schools have departments devoted to orthopaedic surgery. Specialists are called orthopedists, though! Relax. Both spellings are correct, but the former is more prevalent in the United States. For the average American, it just makes sense to drop that vestigial “a”. The latter spelling is older and more traditional, dating back to the 18th century. That’s why it appears in educational, historical, and medical contexts. Now for the definition: Orthopedics is a branch of medical study focusing on the skeleton and the muscles. Correction, prevention, and treatment of sports injuries, physical trauma, congenital conditions and more fall under this. What Makes a Pillow Orthopedic? Orthopedics usually refers to orthopedic surgery or orthopedic physical therapy. The latter can mean anything from post-operative rehabilitation to routine pain management. Here’s where orthopedic pillows come in handy. We spend about a third of our lives sleeping; and even more sitting or lying in bed while awake. Normal pillows bolster the head, neck or other body parts; helping us find comfort in a prone or sitting position. Orthopedic pillows take this to the next level. They help not only with comfort, but also pain management. Designs and instructions for use often follow orthopedic guidelines, and can be very specific in nature. Orthopedic pillows can also be called therapeutic pillows. Why? Some designs claim to be able to help with non-orthopedic difficulties! Easing breathing difficulties, blood circulation problems, and gastroesophageal troubles can be possible with the right pillow. In particular, we’ve seen a rise in marketing therapeutic wedge pillows for acid reflux and heartburn. Same goes for therapeutic wedge pillows for snoring. We’ll discuss these in more detail later on. These indications are on top of relief from many different kinds of physical pain. Orthopedic pillows are pillows for back pain, neck pain, post-injury pain, sciatica pain, whiplash—the list goes on. Overall, the result is less discomfort, and in turn, better sleep quality and longer sleep duration. Matching the correct orthopedic or therapeutic pillow to your needs is important. It’s like choosing a mattress; if it’s not the right one, you won’t be truly comfortable. Pay attention to a pillow’s materials and firmness, your medical history and habits, and shape—both yours and the pillow’s. These will be guideposts in the search for the best orthopedic pillow for you. You may know wedge pillows by other names; like reading pillow, triangle pillow or even TV pillow. These orthopedic pillows are versatile and serve a variety of purposes. What does a wedge pillow look like? This is a pillow with a descriptive name, so it’s not hard to imagine. Think of the general shape of a doorstop, or a slice of cheese cut from a whole wheel. Whatever the size of the wedge pillow—they come in several, some big enough to cover half a bed—it will always have a right angle and an exaggerated slope. Popular variants are 15 degree angle and 30 degree angle wedge pillows. When propped up, wedge pillows are ideal for supporting a sitting position. You can lean back against one when you’re reading, watching TV, or resting in bed. They take the place of a hard headboard or normal pillows that may need constant adjustment or fluffing. When laid flat, wedge pillows can be used to promote better sleep quality. An incline resulting in an elevated upper body can work wonders to improve a variety of health issues that can interrupt nighttime rest. These pillows are often used to relieve symptoms of acid reflux and gastroesophageal reflux disease (GERD). Got heartburn? Find relief in using a wedge pillow. Pillows with a gentle slant of 15 degrees or less may even be used to help babies with acid reflux or breathing issues. You may want to consult your pediatrician before doing the latter, though. While we’re on the subject of breathing problems while sleeping, let’s talk about snoring and sleep apnea. Sleeping on wedge pillows with slants of 30 degrees or wider may help adults who suffer from these. Of course, it will also help if you just have a cold or allergies; even mild pregnancy pains. In a pinch, wedge pillows can also be used to prop up feet or legs to improve circulation while resting. As a testament to its versatility, wedge pillows can even be lap pillows or mini desks. The incline can be an ideal surface for a book, tablet or other device. 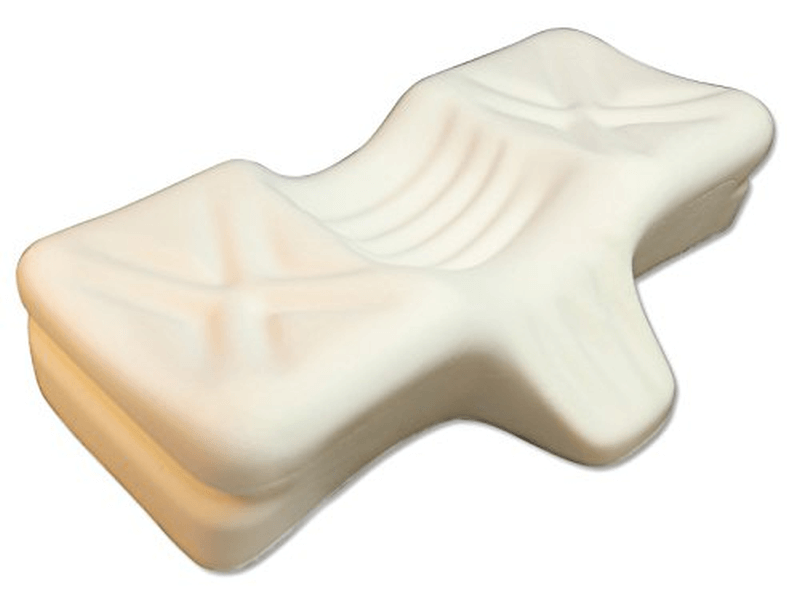 Wedge pillows are easily one of the most popular types of orthopedic pillow. You will be able to find them in most large physical and online retail stores. Often the item information and name will include what the pillow size and design is best suited for, so if you’re feeling lost, it helps to read the labels. Below are some of our favorites. The orthopedic pillow we’re talking about here is the ubiquitous travel pillow used by people in buses, trains and planes. Neck pillows are about as popular as wedge pillows, if not more so. Because they’re so commonplace, they’re also one of the most ineffective—if you buy a cheap, style-over-substance one, that is. You may know by more descriptive names, like horseshoe pillow or u-shaped pillow. Worth noting, though, that these descriptions may also apply to full body pillows in the same shape. A proper neck pillow should be big enough to fit around the neck, and responsive enough to conform to your body and resting stance. It should also be compact and easy to carry around. Note that this orthopedic pillow is different from the shaped pillows that are laid flat on the bed and used to support your neck while lying down. They’re called cervical pillows, but are known as neck pillows, too; so it’s easy to get confused. Like wedge pillows, neck pillows are everywhere. You can find them anywhere from sleep clinics, to airport souvenir shop, to your local Walgreens or Target. Should you be looking to purchase one, make sure to get a design that is compatible with your neck size–snug but not uncomfortably so. 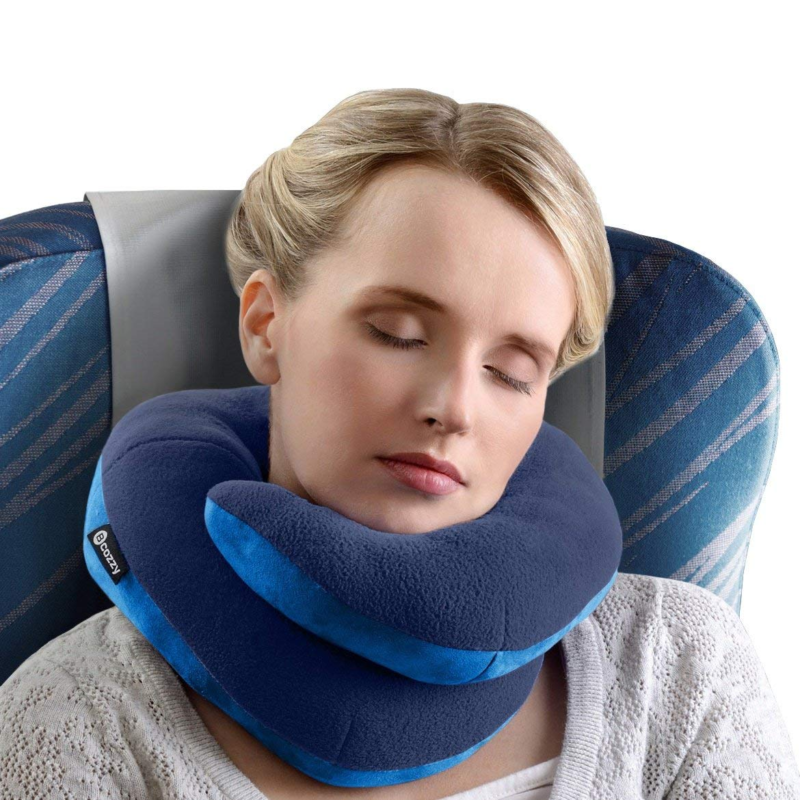 Looking to travel with your neck pillow? You may appreciate bundled in add-ons, like sleep masks and storage pouches. Some brands sell neck pillows with these extra items. Below are some of our favorites. What Is a Lumbar Pillow? These half-moon shaped bolsters can technically be used as a quick fix for leg elevation or neck support, but lumbar pillows are not designed to have more than one real purpose. Lumbar pillows are different from the orthopedic pillows we’re discussed so far, in that they’re not meant to be used while lying down or sleeping. What is this purpose? It’s to help you maintain good posture while providing mid and lower back support as you are sitting down. A good number of designs even include an attachment that allows you to firmly strap it onto a chair’s backrest. 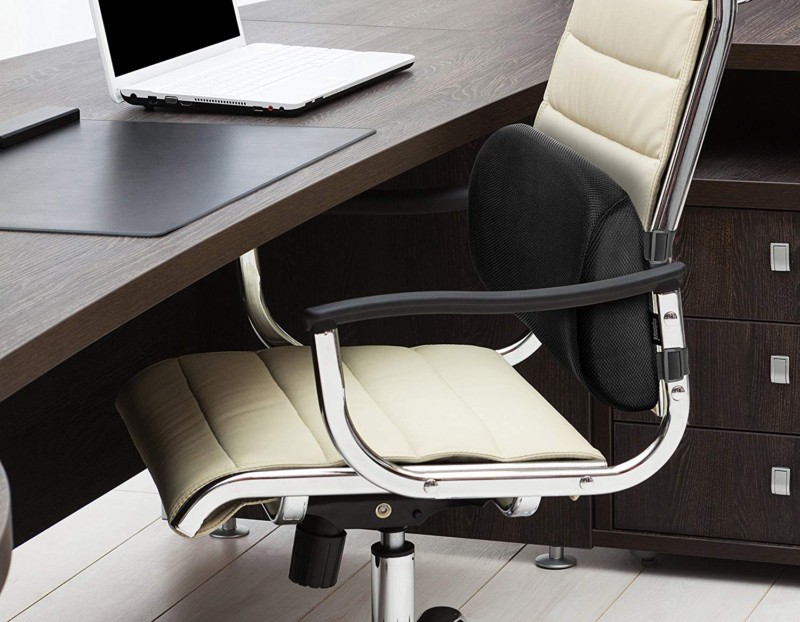 Lumbar pillows are common fixtures in offices and cars—or, for that matter, any place where situation that dictate long periods of being seated may arise. It’s not hard to find lumbar pillows available in online stores or brick and mortar ones. What’s important to remember here is to consider how much you will be using any pillow of this kind, should you purchase one. Are you going to leaning against it all day at work, or leaving it on a car seat or at your home office chair, mostly unused? For daily workhorse lumbar pillows, consider getting more expensive options, so they last longer. For occasional use lumbar pillows, you may want to save by getting more affordable variants. Below are some of our mid-range favorites. Also known as contour leg pillows, these are most often designed to follow an ergonomic hourglass shape. The slimmest point is placed between the legs right near the knees, while in a side sleeping position. That’s right: The knee pillow is a pillow for side sleepers! This corrects bad weight distribution and maintains ideal body alignment. Knee pillows are ideal for easing sciatica pain and lower back pressure, as well as encouraging blood circulation improvement. Other uses include providing support for those experiencing pregnancy pains, or ongoing knee or leg injury recovery. The knee pillow isn’t as easy to find as other, more common, orthopedic pillows—unless you’re at a specialty store or a clinic. You best best is to look for one online. Looking to use a knee pillow constantly for the foreseeable future? You may appreciate additional features, like a machine washable cover or leg straps. Check for these add-ons before making a final choice. Below are our favorites. A cervical pillow is sometimes called a neck pillow or a contour pillow. This orthopedic pillow is supposed to provide ergonomic head, neck, shoulder and even spinal support; and promote safe weight distribution. While some cervical pillows are designed with only one position in mind, many are multi-purpose and can adapt to back and side sleeper habits. These pillows help with breathing problems—including sleep apnea and snoring—as well as neck and shoulder pain and stiffness. There are so many kinds of cervical pillows! Online is where we recommend you check out each sub type of this kind of orthopedic pillow. There are just so many to choose from, and at a physical store or clinic, it’s doubtful that they will have more than a few in stock. We’ve recommended some of our favorite u-shaped cervical support pillows and and cylindrical bolsters before in a different article, so here we’ll focus on more oddly-shaped variants! Check them out below. These come in all shapes and sizes, and some are actually not orthopedic pillows at all—just long, colorful bolsters meant for hugging, without any medical or ergonomic knowledge put into the product design. These layman and often culturally-specific varieties are particularly popular in Asia: Japan’s dakimakura, Vietnam’s gối ôm, Malaysia’s bantal peluk, and Indonesia’s bantal guling are just a few examples. Actual orthopedic body pillows are often more than just long and straight bolsters. Manufacturers create proprietary designs that often feature one or more prominent curves. The length and curvature allows sleepers to not only hug the pillow, but find a comfortable position that supports and cradles most of their body parts. Orthopedic pillows can provide support and comfort from the head, neck and shoulders; to the back, spine and even the knees and legs. Worth noting, though, that body pillows are usually preferred by side sleepers. If you’re looking for a simple straight bolster, you can probably find them easily in retail stores. However, for more involved and complicated variants, you might want to check online. Or: Go to a baby store and see if they have maternity or pregnancy pillows. Some orthopedic body pillows are marketed specifically for those experiencing pregnancy, but they will work for everyone. Below are our favorites of each orthopedic body pillow variant: c-shaped, u-shaped, and straight. Why Use an Orthopedic Pillow? Because this is an industry with close medical ties, standards are changing every day; and more and more designs come out each year. This is just a handful of orthopedic pillow types currently available. You may be thinking of getting one, but are hesitating because of the cost or some other reason. The bottom line: If you need it, and especially if it’s prescribed by a medical professional, you will find that an orthopedic pillow will work wonders. However, these sleeping companions require quite a bit more thought and care to maintain than their usual normal counterparts. With orthopedic pillows in particular, the material used is important. If you need an orthopedic pillow, chances are you’re suffering from chronic pain or pressure and will need to use to product constantly—even when you’re not asleep. The material needs to be not only durable and resistant to damage and warping, but also responsive. Heat transfer is also an issue; many of these products use memory foam, but sometimes what you get in terms of comfort and contour you lose in cooling and springiness. Removable and easily washable covers are also important—not only will you need to clean it regularly, but some of these pillow have highly stylized designs and very particular shapes, so you may not the option to just a third party pillowcase. And, as with any product that’s for long term use, try to get an orthopedic pillow with a guarantee, return policy or warranty.